This is part two of a multi-part series on setting up a pulley system for heavy kiln lids. Click here to go to part one. A pulley system for lifting a kiln lid has three main components: the pulley, the rope or wire, and a way to hold the kiln open once the pulley does its job. Technically, a pulley is a simple machine that consists of a wheel and some rope or wire. However, most people think of the wheel and the rope as two separate components. Pulleys are sometimes available in a set with the rope or wire, but it's more typical for the two items to be sold separately. A pulley will look something like the illustration at right. To use the pulley, it is usually attached to a ceiling above the kiln. A long screw with a hook on the end is one way this is commonly done (but there are other ways). Once the pulley is securely in place, a rope is wire is strung around the wheel of the pulley, so that it goes from the handle or handles of the kiln lid and through the pulley. One main thing to watch for when purchasing a pulley is that it is capable of lifting the desired amount of weight; for most kiln lids, a capability of 150 pounds/70kg should be adequate. A simple pulley should cost well under US $10, even including the screw/hook hardware required to attach it to the ceiling. Movable pulleys are more complicated pulley arrangements that can also do the job, but they are usually used for heavier loads than most kiln lids. The "block and tackle" (sometimes called a "rope hoist" or a "combined pulley") is one kind of more complicated pulley arrangement. 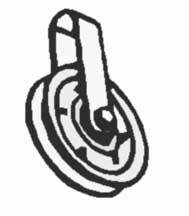 Click here to go to a site that has some basic information about how a pulley works. Click here for a discussion of the next element of the setup, the rope or wire. And don't worry if you're a little confused or overwhelmed by the details and all the various options. There are many different ways to set up a pulley system. Once these three major components are covered, we'll cover step-by-step procedures on how to put them together to make a basic pulley system for lifting the lid of a coffin kiln.